View the CFP for the conference. View the poster from the conference. View the schedule from the conference. Watch the complete lecture here. Une causerie avec Michel Jourde, Professeur de littérature française, Ecole Normale Supérieure de Lyon. Le déjeuner sera servi. On Friday, October 23, 2015, this one day symposium focused on Roland Barthes, one of last century’s leading European essayists and critics. Whether writing on popular phenomena like soap-ads and wrestling, Honoré de Balzac’s work, or the most private of photographs, Barthes has indelibly influenced the way we think of the relationship between words, images, objects, and affects. To mark the centenary of his birth, the Department of French and Italian presented a one-day interdisciplinary symposium, bringing together renowned European and American scholars. The symposium aimed at interrogating Barthes’ complex legacy in the fields of literary and visual studies while also questioning the notion of legacy itself: How do we critically inherit an author’s critical legacy? What kind of relationship to the future does a legacy open up for those who actively receive it? The May 29, 2015 Graduate Student Conference, “Radicalisms: Movements and Moments,” opened a critical dialogue about the nature, potential, and limits of “radicalism” in academia. The conference featured a keynote address by Kent State University’s Professor Kevin Floyd. In his compelling talk, entitled “Gendered Labor and Abstract Life,” Professor Floyd offered a Marxist critique of gendered forms of value-producing labor in the debt-ridden global South. The afternoon panels brought together graduate students in Art History, Comparative Literature, English, and French, including our own Matthew Brauer, Joseph Derosier, and Jessica Neuschwander. It was organized by Rachel Grimm, Colin Jackson, Arachi Jung, and Brian McLoughlin. On May 21, 2015, Michela Minesso, Professor of Contemporary History at the University of Milan, gave a lecture called "An Innovative International Ruling Class: Industrial and Technical Elites in Milan Between Liberalism and Fascism," on the central role of industrial and technical élites of Milan in the Italian industrialization occurring between the end of the 19th century and the rise to power of fascism, including the environments and the institutions in which those élites operated. View the poster from this event. On May 19, 2015, Elizaveta Strakhov, Mellon Postdoctoral Fellow in French Medieval Literature, gave a lecture titled “The Silence of the Lambs: The French Pastourelle and Critiques of the Hundred Years War.” It was followed by lively discussion among graduate students and faculty, and a well-attended reception. 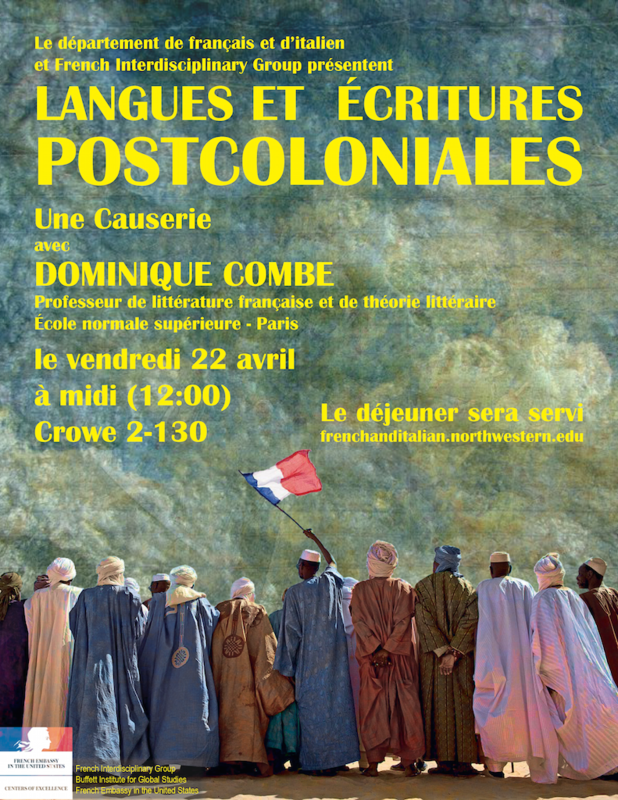 On May 11, 2015, Makram Abbes of Ecole Normale Supérieure-Lyon gave a talk titled "Maximes, poésies et récits: rhétorique et politique dans les textes arabes." View the flyer from this event. On April 27, 2015, Pannill Camp of Washington University in St. Louis gave a lecture, “Irruption and Awakening: The Masonic Plays and Revolutionary Festivals of François-Félix Nogaret” (1740-1831), which is part of his book project on the relations between theater, rituals, Freemasonry, and the French Revolution. On April 23, 2015, Marc Crépon led a causerie entitled "Contrer la violence: réflexions après les événements du 7 au 9 janvier à Paris." On April 20, 2015, Isabelle Alfandary of the Université de la Sorbonne-Nouvelle (Paris III) presented a talk entitled “Derrida-Lacan: In Between Psychoanalysis and Deconstruction,” through the support of the Department of French and Italian and the French Interdisciplinary Group. The talk explored new intersections between Lacanian psychoanalytic theory and Derridean thought. On March 3, 2015, Dr. Christopher Atwood, a visiting lecturer in Italian, presented a multi-media talk on Futurist art (1909-144) titled "Modernity, Machines and Motor Oil: Italian Futurist Art and Ideals." Topics discussed included Futurists’ representations of speed, the movement’s relationship with Fascism, and the revolutionary Futurist Cookbook (1931). On February 9, 2015, Dr. Christopher Davis gave a lecture titled "Each in their Latin: Grammar, Poetics, and Old Occitan as a Literary Language."